where break-even prices are lower than 55$. We compared production costs for all global producers. 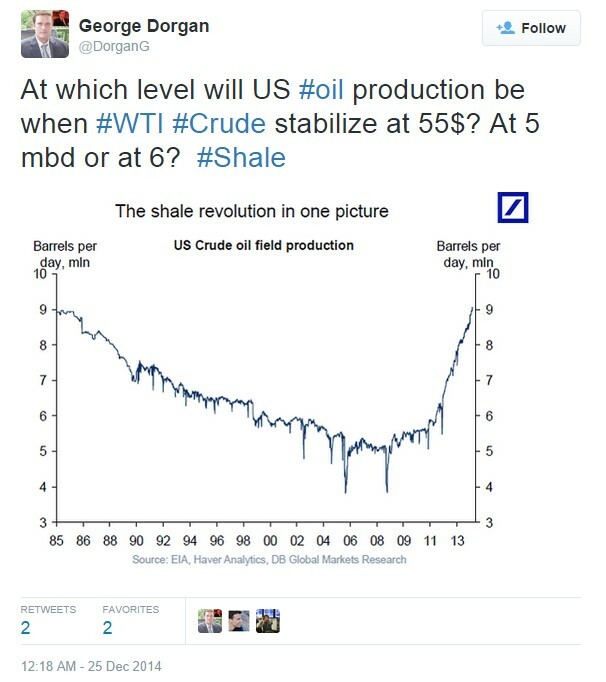 It gives indications why 55$ for WTI and 60$ is the equilibrium price at a global scale. Update January 06, 2015: As opposed to prices of 55$ for WTI and 60$ for Brent, current WTI prices under 50$ and Brent prices of 53$ are not sustainable because much of the shale oil will drop out of the market in some years. Less supply, however, will again translate in higher prices. projected pace of Canadian oil sands development." barrel WTI and $100 per barrel Brent." 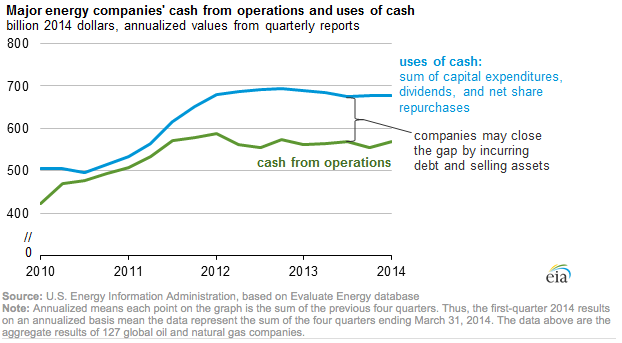 improve drilling and fracturing performance - essentially getting more from shale wells for less capex." "U.S. shale is now no longer the marginal barrel, with cash breakevens in some major U.S. shale plays having dropped by up to $30 per barrel since 2012." Nov 28, 2014: Citi comes with the following break-even overview for US shale oil. The question remains if this data reflects “marginal costs”, the costs for additional supply and the depletion of existing fields. Our table based on Natixis above was more concentrated on “marginal costs”. Citi thinks that the US shale production may be sustainable at 70$, and on a shorter term basis at even lower prices (via business insider). If however the price remains around 55$ for longer, then all those shale companies will go bankrupt. Oil production costs based on oil sands on Canada’s Alberta seem to be higher than market prices. One major issue is the high transport cost to refineries, even if the Keystone XL pipeline is built, 18$ per barrel to convert the heavy oil and to reach the not yet existing pipeline and about 30$ total transport costs by train. 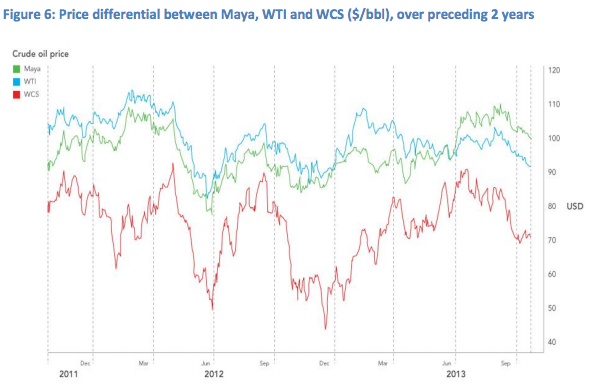 Reducing the Brent-WTI spread seems to be an obvious idea via oil arbitrage, still it seems to be difficult. A new study (PDF) examining the economics of Western Canada’s oil sands finds that even if the Keystone XL pipeline gets built, it’s unlikely that extracting the heavy, tar-like oil around Alberta will remain commercially viable over the next decade. The report, written by two former Deutsche Bank (DB) analysts and titled Keystone XL Pipeline: A Potential Mirage for Oil-Sands Investors, calculates that producers in Western Canada will need to fetch at least $65 a barrel to attract new investments and ensure that current projects remain profitable. During the past month a barrel of Western Canadian Select (WCS), the main benchmark used to price Canada’s heavy oil, has averaged just $58. New data for Canadian sands oil production costs come from Christoph Aublinger on Seeking Alpha. The real value of the Keystone XL is that it would deliver oil-sands crude down to the Gulf Coast, where it could compete with Mexican crude priced against the Maya benchmark. Heavy Mexican oil enjoys a $20 premium over its Canadian rival and is trading at about $87 a barrel. Even if the Keystone XL gets approved, just getting Canada’s crude down to the Gulf is barely enough to make it worthwhile. Mark Lewis, one of the new Keystone report’s co-authors, estimates that between the transport costs and the extra lubricants needed to coax the oil through thousands of miles of pipeline, it would cost about $18 a barrel to get that tar-sand crude from Western Canada down to the Gulf Coast on the Keystone XL. Prices at the Clearbrook, a junction for pipelines heading to the Midwest and Gulf Coast, offer a rough gauge, but do not always reflect producers’ financial reality. 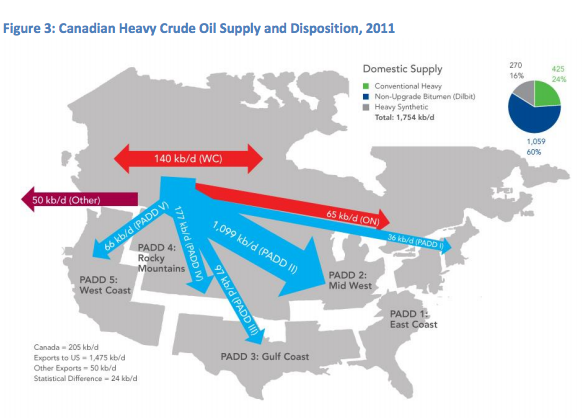 Some can fetch $10 a barrel more by shipping it by rail, a costlier mode of transportation but one that avoids the glut at Clearbrook and delivers oil to premium markets on the East and West coasts, where crude prices tend to be based on the Brent benchmark, some $25 a barrel dearer at current prices. The fact of the matter is that oil shale or not, we’re in a position of running as hard as we can just to stay in place. Remember, it’s all about net energy. If you’re not getting more energy from the oil, than it takes to extract the oil, what’s the point? And you have to get a lot more. It has to be enough to support extraction, refining and distribution PLUS the economic activities for which it’s intended, mostly transportation.The first Pennsylvania oil wells were getting estimated energy returns of 1000:1. In West Texas in the 1960s, estimates ran to 100:1. These days, even the Saudi’s are only getting estimates of 30:1 and oil sands in Canada have nice low returns of 4:1. Bottom line? The total net energy in first half of the conventional oil (energy return x quantity) was much greater than the total net energy remaining in the second half of the conventional oil. Imagine a battery that lasted 10 hours, but on the first hour, you got 1000 watts, the 5th hour, you got 100 watts, and at the 10th hour, you’re pulling barely a watt. That’s roughly analogous to our situation with oil. The oil is there, for sure, but we got the high net energy stuff first (i.e. light sweet crude, close to the surface). What’s left is, for lack of a better word, crud. Yes, we can get it. Yes, it’ll work, but it just takes more energy to get it out and refined than it used to, increasing the price and decreasing the utility forevermore. There will be price fluctuations as with any commodity, but the long term price trend-line goes up from here on out. Depletion: Bakken region in Montana 40% dropped in production, will in Bakken- North Dakota happen the same? 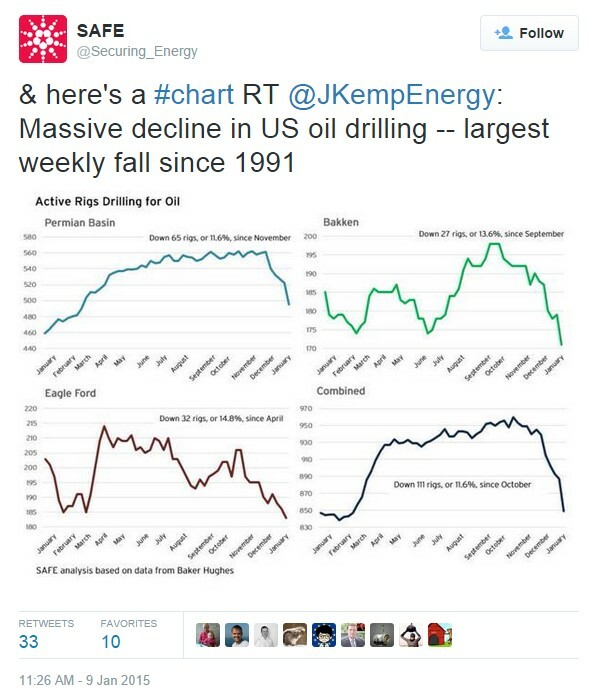 Worse could be yet to come as meaningful historical drilling data begins to emerge from more mature regions. According to Bob Brackett, an analyst with Bernstein Research, production from shale oil in the Bakken region of Montana has seen a 40% drop in production since 2006, this despite increased investment and technological improvements. He puts the decrease down to the fact that not all shale oil plays are equal — inevitably the best areas are drilled first — and anticipates the same curve will occur in the much vaunted Bakken play in North Dakota. There have of course been warnings, not least by Art Berman, and Ian Urbina at the NYT, but the popular narrative remains one of abundance. We now have more than enough data to know what has really happened in America. Shale has been hyped (“Saudi America”) and investors have poured hundreds of billions of dollars into the shale sector. If you invest this much, you get a lot of wells, even though shale wells cost about twice as much as ordinary ones. Sanford C. Bernstein, the Wall Street research company, calls the rapid increase in production costs “the dark side of the golden age of shale”. In a recent analysis, it estimates that non-Opec marginal cost of production rose last year to $104.5 a barrel, up more than 13 per cent from $92.3 a barrel in 2011. The big increase will have implications both for the market and oil companies, helping to put a floor to energy prices but also capping the profitability of the sector. Just a few of the roadblocks: Independent producers will spend $1.50 drilling this year for every dollar they get back. Even with crude prices above $100 a barrel, U.S. independent producers will spend $1.50 drilling this year for every dollar they get back from selling oil and gas and will carry debt that is twice as much as annual earnings. By contrast, the net debt of Exxon Mobil Corp., the world’s largest energy explorer by market value, is less than half of the cash earned from operations last year. The company will spend 68 cents for every dollar it gets back this year. North Dakota crude oil prices tumbled this month to below the $80-a-barrel “sweet spot” that helps drillers attract capital from other shale areas, yet the Bakken boom shows no signs of slowing.Even though prices have slumped to their lowest in more than a year, output keeps marching ahead thanks to falling operational costs, increasingly efficient well technology, rising reserve estimates and aggressive forward hedging programs. Experts say the 1 million barrel per day (bpd) mark will probably be reached by early next year. Local cash prices, which have fallen some $25 a barrel in the past two months, would have to suffer a sustained decline to $70 a barrel or lower to jeopardize near-term spending, analysts said, a prospect most deem unlikely for the moment…. For example, Kodiak Oil and Gas Corp (KOG.N) has hedged about half of its 2014 production at about $93 per barrel, far above current prices. Executives said they expect to add to the hedging position going into the new year. With savings, improved production rates and hedging, the break-even point is still a way off by most accounts. 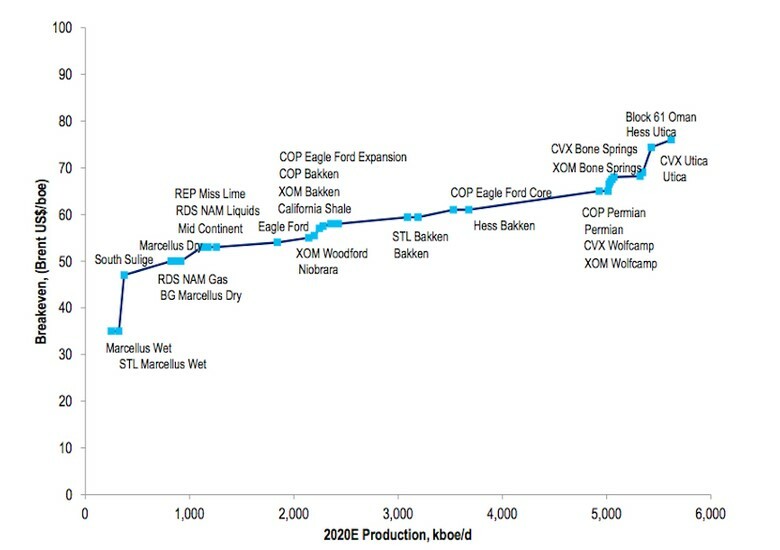 But formulating a break-even price is no simple matter and analysts differ in their calculations as the more than 100 operators in the Bakken have different costs, access to acreage of varying quality and distinct success rates in producing oil. “We’ve seen tremendous variability in cost and well performance between operators as each tests different methods of well completion,” said Jonathan Garrett, analyst at Wood Mackenzie. Bakken crude for June delivery at the Clearbrook, Minnesota hub was bid as low as $85.24 a barrel on Wednesday and offered at $93.69, down 6.5 percent from October levels, according to traders. For now, prices are comfortably above the $68 a barrel breakeven point for a 15 percent rate of return, according to Credit Suisse analysis. Rock, you constantly put down Art Berman, the OilDrum and even little ole’ me. It gets tiring. I am not a geologist, never claim to be, and have in fact learned a great deal from professionals like you, but especially over at the oildrum. Why don’t you take you virulent attacks over there and instead lighten up on the amateurs here. It is not attractive of you. Perhaps if you quit making claims that are completely wrong with an air of authority? If you’re an amateur then don’t pretend to have knowledge you don’t. I do not “put down” Art Berman (I’ve actually met him and listened to his arguments with a few executive at a small table), what I do point out is his database isn’t anywhere near what the industry works with which limits the veracity of his claims. i am having a very difficult time trying to determine what is the breKeven PRICE FOR THE OIL DRILLER IN BAKEEN WLL , EOG, l especially small caps eox,HK,and in permian basin like fang pe etc , EAGLE FORD AND THE NAT GAS PLAYS IA WITH SUCH MHR, chk etc. THERE MUST BE A SIMPLE WAS to do this and there must be examples on how to do but how you did this using the numbers and the formulas if any. ‘ i have searched the net and can’t find any examples that show how it is done. i kow cutting cPEX OR JUST CAPEX SPENDING IS ONE KEY BUT I DON’T KNOW HOW TO USE IT AS I AM ONLY INFORMED ABOUT ABOUT PE’S AND DON’T USING CFLO HOW TO DETerMINE WHICH ARE PROFITABLE AS Well which are more expensive than its rivals. i have seen huge cuts in capex but can’t use it . i have a hand injury so i apologize for my typing as i can not make corrections as i have severe limitations and typing this is very difficult. if there are web sites that are helpful to me please include those as well but i am almost ertain that your re[rentations ND examples will do the job well.